Whether it’s CNN host Jake Tapper tweeting or Canadian officials making statements to the press, the news tends to make an impact on what people search in the dictionary. Here’s a peek at the words that had folks guessing this week! Tensions between the United States and our northern neighbor, Canada, are at an all-time high this week, with President Donald Trump and Canadian Prime Minister Justin Trudeau at odds over tariffs. 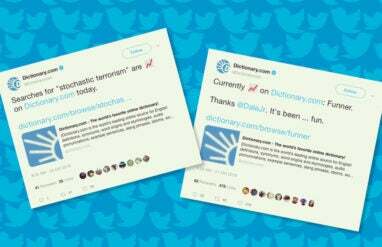 But, it was a comment from Canadian Foreign Affairs Minister Chrystia Freeland that sent searches for ad hominem flying up 1,840% on Dictionary.com. After a series of tweets by the president in reference to Trudeau, Freeland told reporters, “Canada does not conduct its diplomacy through ad hominem attacks.” Ad hominem means attacking an opponent’s character rather than answering his argument. GOP strategist Steve Schmidt is no stranger to Dictionary.com’s Trending Word list. He recently boosted search traffic for the meaning of shambolic. 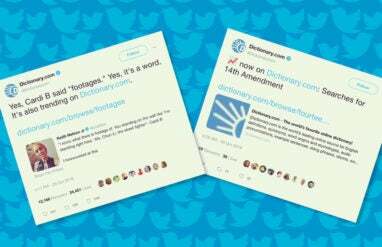 But, this week it was Schmidt’s tweet saying President Trump “beclowned” himself that sparked searches and made the word trend for the first time. Alas, beclowned is not in our dictionary. But, it’s pretty fun to say! Sad news out of the Kansas City Zoo boosted searches for necropsy 113% this week. The zoo announced on Facebook that it had lost one of its young cheetahs. The reason for the creature’s death is still up in the air, but a necropsy or “examination of the body” was performed. It is with great sadness that we announce that one of our three cheetah brothers, Drogon, died unexpectedly yesterday…. Debate over the fate of the meeting between President Donald Trump and North Korean leader Kim Jong Un helped boost searches for a number of words this week. Denuclearize, which means “to remove nuclear weapons from” saw the biggest spike at 5,308%, followed by gulag or “a prison or detention camp, especially for political prisoners” with a 493% spike. Bringing up the rear was Manchurian candidate with a 176% jump this week. It means “a person, especially a politician, being used as a puppet by an enemy power.” Originating as the title of a ’50s thriller by Richard Condon, the term is commonly used to indicate disloyalty or corruption, whether intentional or unintentional. With Pride Month well under way across the nation, a number of LGBTQ-related terms have spiked on Dictionary.com but kiki earns the biggest leap this week with a 567% jump. A kiki is a social gathering, usually for the purpose of casually “kicking back,” gossiping, and sharing stories, and it’s typically associated with the LGBTQ community. The word can also refer to a ballroom drag subculture that celebrates gender nonconformity, racial diversity, and sexual openness. Attorney George Conway (husband of Trump advisor Kellyanne Conway) published a rather lengthy takedown of the president’s “terrible arguments” this week in the LawFare blog. 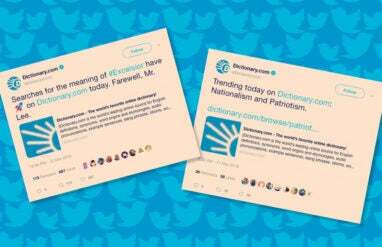 That the spouse of a presidential advisor has continuously trolled the president is news in and of itself, but the big news for Dictionary.com readers is how Conway affected word searches this week! Thirsty for more trending words? Find out why pardon, mewling, and merrily were words of the week earlier this month!